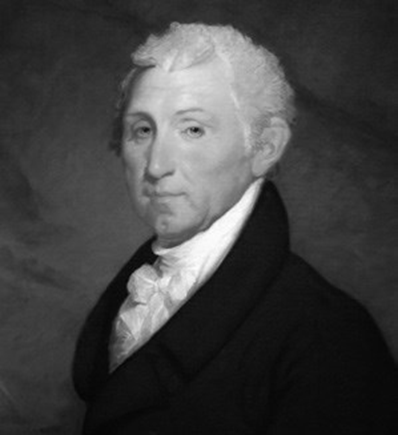 As a youthful politician, he joined the anti-Federalists in the Virginia Convention, which ratified the Constitution; and in 1790, an advocate of Jeffersonian policies, Monroe was elected a United States senator. As minister to France from 1794 to 1796, he displayed strong sympathies for the French cause; later, with Robert R. Livingston, he helped negotiate the Louisiana Purchase. His ambition and energy, together with the backing of President Madison, made him the Republican choice for the presidency in 1816. With little Federalist opposition, he easily won reelection in 1820. Monroe made unusually strong cabinet choices, naming a Southerner, John C. Calhoun, as secretary of war, and a Northerner, John Quincy Adams, as secretary of state. Only Henry Clay’s refusal kept Monroe from adding an outstanding Westerner. Early in his administration, Monroe undertook a goodwill tour. In Boston, his visit was hailed as the beginning of an “Era of Good Feelings.” Unfortunately these “good feelings” did not endure, although Monroe, his popularity undiminished, followed nationalist policies. In foreign affairs Monroe proclaimed the fundamental policy that bears his name, responding to the threat that the more conservative governments in Europe might try to aid Spain in winning back her former Latin American colonies. Monroe did not begin formally to recognize the young sister republics until 1822, after ascertaining that Congress would vote appropriations for diplomatic missions. Monroe accepted Adams’s advice. Not only must Latin America be left alone, he warned, but also Russia must not encroach southward on the Pacific coast. “ The American continents,” he stated, “by the free and independent condition which they have assumed and maintain, are henceforth not to be considered as subjects for future colonization by any European Power.” Some twenty years after Monroe died, this became known as the Monroe Doctrine. Most of all, the legacy of James Monroe is a model of what a brave leader can do. He dared to do difficult acts and, in return, accomplished even greater feats. Monroe died from heart failure and tuberculosis on July 4, 1831, thus becoming the third president who died on Independence Day. His death came fifty-five years after the US Declaration of Independence was proclaimed and five years after the deaths of two other Founding Fathers who became presidents: John Adams and Thomas Jefferson. Monroe was originally buried in New York at the Gouverneur family’s vault in the New York City Marble Cemetery. Twenty-seven years later, in 1858, the body was reinterred in the Presidents Circle at the Hollywood Cemetery in Richmond, Virginia. The James Monroe Tomb is a US National Historic Landmark. Sources of information: WhiteHouse.gov, presidential biographies are from The Presidents of the United States of America by Michael Beschloss and Hugh Sidey. The White House Historical Association. Totallyhistory.com.